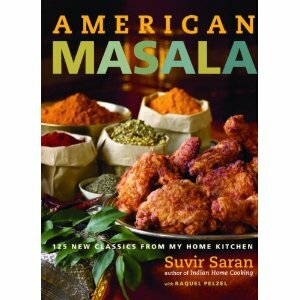 Click here to buy American Masala now from Amazon. Grandma Hayes in West Virginia taught me how to make cast iron skillet cornbread. By adding some Indian spices and seasonings, I’ve adjusted her recipe to reflect my cooking style. This cornbread has become a staple in my home and a favorite among many friends. Fresh corn kernels (from 3 large or 4 small-medium ears) or 2 cups of thawed frozen kernels. Heat oven to 400°F and set an oven rack at the lowest position. Melt butter in a 9-inch cast iron skillet over medium-high heat. Once melted, reduce the heat to low. Place corn, chopped onion, cheese, corn muffin mix, flour, cilantro, jalapeño, salt, cayenne pepper and cracked pepper in a large bowl and set it aside. Lightly whisk the egg and yogurt together in a medium bowl and add it to the corn mixture, stirring until just combined (the consistency will be thick). Pour the cornbread batter into the hot skillet and using a rubber spatula, press batter into the pan. The butter will rise up the sides of skillet and over top of batter. Tilt the skillet toward you, and then rotate it away from you to evenly coat the top of the batter with melted butter. Bake until top is golden brown and a cake tester comes out clean, about 30 to 35 minutes (some butter will still be bubbling around the edges of the skillet). Set it aside to cool for at least 5 minutes before slicing and serving. Adapted from American Masala (Clarkson Potter) Copyright Suvir Saran.